The re-organization of three British North American Crown colonies – the United Province of Canada, New Brunswick, and Nova Scotia – into a federation under the Imperial Crown created a unique type of polity. John A. Macdonald first sought to name the new federal state resulting from Confederation “The Kingdom of Canada”, but the British Foreign Secretary vetoed the proposal, fearing that such a name would invite hostility from the American republic.At the London Conference in 1866, the Fathers of Confederation and the British government needed to agree on a new name. Sir Samuel Leonard Tilley of New Brunswick supposedly provided this inspiration by looking to the King James Authorised Translation of the Holy Bible, and Psalm 72: 8, which reads: “And he shall have dominion also from sea to sea, from the rivers unto the ends of the earth.” This passage corresponds well to uniting British North America into one polity because the “he” refers to King Solomon, and Chapter 72 of the Psalm focuses on good kingship. While Canadian historian A.H.U. Colquhoun considers the biblical origins of the “Dominion of Canada” apocryphal (pun intended), this passage probably still influenced the original choice of name of this country, “The Dominion of Canada.” The Department of Canadian Heritage acknowledges that the national motto contained in our coat of arms, Ad mari usque ad mare (“From Sea to Sea”), comes from Psalm 72:8. The ribbon of our coat of arms contains the phrase desiderantes meliorem patriam (“desiring a better country”), which comes from Hebrews 11:16. This name for our national day would endure for over one century, though the Parliament of Canada and the Canada Gazette both dropped the term in the later 1940s. Contrary to what some of my readers have suggested in the comments section on previous, similar posts, I am not arguing that Sir Samuel Leonard Tilley created the word “Dominion” for the first time — which, frankly, should be rather obvious, given that I also suggested that Tilley and our Fathers of Confederation derived the use of the word from the King James Authorized Translation of the Holy Bible and Psalm 72:8. The English word “Dominion” is therefore at least as old as the KJV itself, which first came out in 1611. As the Bible shows, “Dominion” has always had a political connotation in the English language; in Psalm 72:8, it evokes having control or sovereignty over a territory. While republicans would argue that it meant British control over Canada, I would suggest that it meant Canada’s consolidation of and control over British North America. “Dominion” also appears in the Bill of Rights, 1689. During the Glorious Revolution, Bostonites and New Yorkers revolted, the colonies in northeastern British America rebelled against the deposed King James II and his appointed Governors, and established the “Dominion of New England”, which consolidated all the colonies of that region into one. While this entity bore the name “Dominion,” its political structure differed significantly from the Dominion of Canada and the other self-governing dominions of the 19th and 20th centures. In other words, the same word was used to describe two completely different governing arrangements. On 12 March 1970, Eugene Forsey appeared before a parliamentary committee and discussed the perennial proposition to change the name of July 1st from Dominion Day to something else. (Judging from what some of the Senators said in 1982, the Trudeau government had tabled other bills to change the name of July 1st, but those bills failed. This exchange comes from a committee studying one of those failed bills). Ultimately, Parliament changed the name of our national day in the early 1982 from the historically significant “Dominion Day” to the historically bereft and pedestrian “Canada Day” – as if Canadians didn’t already know that they lived in Canada and needed the government to remind them of the country’s name. Professor Forsey has provided witty testimony against the republicans who sought to erase Dominion Day and replace it with banal platitude. Well, I think it [Canada Day] is devoid of the historical associations which you do get either in Dominion Day or in Mr. Hogarth’s suggestion Confederation Day. It takes the historical zip out of the thing somehow and it seems to me that you want to have something in the name of the day if possible. You want to have something to commemorate some historical event and this was a meaningful historical event. Just as I would say, if the United States called its national holiday “United States Day”, that would be a rather colourless and banal description of that day. They call it, to the best of my belief, “Independence Day”, and I think that immediately recalls to every American the fact that on July 4, 1776, the 13 colonies became the United States of America. I think it has an evocative touch to it that you would not get if you simply said “United States Day.” […] Similarly, if you called the French national holiday “Bastille Day”, as I think it usually is called, again it seems to me that you would be taking some of the historical significance out of the thing. In 1970, the Trudeau government was still attempting to change the name of our national holiday legitimately and under the full scrutiny of a government bill tabled by a responsible minister and put before a committee of the House of Commons. Having failed to achieve its revolutionary aim through the standard parliamentary process in the 1970s, some Liberal backbenchers sympathetic to the Trudeau Project seized their opportunity on 9 July 1982 to ram a private member’s bill to the same effect through the House of Commons at 4:30 on a Friday afternoon – all without the quorum of 20 members mandated by section 48 of the British North America Act, 1867. On the afternoon of 9 July 1982, thirteen MPs rammed the Act to Amend the Holidays Act through Second Reading, Committee, Report, and Third Reading in mere minutes in order to change the name of Canada’s national day from Dominion Day to Canada Day. The official transcript of this incident takes up only one page’s worth of space in the Commons Debates, and the House immediately adjourned thereafter. In his triumphalism, Rose brazenly glossed over the parliamentary coup d’état in which he had just participated. 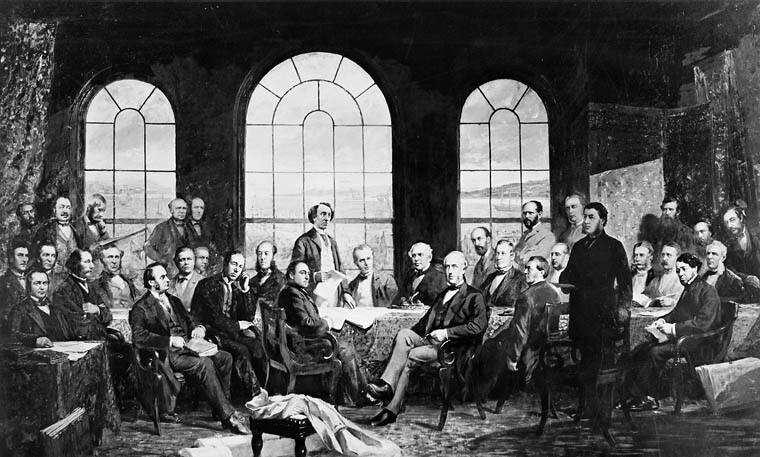 The House of Commons acted unconstitutionally and did not validly pass this bill, because section 48 of the British North America Act, 1867 mandates that a quorum in the House of Commons is 20, not 13: “The Presence of at least Twenty Members of the House of Commons shall be necessary to constitute a Meeting of the House for the Exercise of its Powers, and for that Purpose the Speaker shall be reckoned as a Member.” For this reason alone, the bill should not have regarded as legitimately passed onto the Senate, and the Senate should have rejected it. In addition, this private member’s bill was not, and could not have been construed as, a matter of confidence in the Trudeau government, so rejecting it would not have threatened the government’s parliamentary position. I’ve heard the argument that Speaker Jeanne Sauvé ultimately should have allowed the debate to stand despite the fact that the Commons fell short of its constitutionally-mandate quorum of 20 MPs because none of the MPs present during the debate protested the lack of quorum. This argument is flawed for two reasons. First and most fundamentally, the Constitution of Canada is the supreme law of the land, and though the House of Commons has the authority to control its own internal affairs, its Standing Orders must conform to the Constitution. If the Standing Orders and a specific provision of the Constitution come into conflict, the Constitution must prevail. Second, David Baker probably would have objected at the time if he had grasped the significance of the parliamentary usurpation that his colleagues were in the middle of orchestrating. Conservative Senator David Walker noted that the House of Commons passed the bill with only 13 members and “to make sure that the bill slipped through, a member asked for ‘unanimous consent that the clock now read five o’clock’” so that the House adjourned immediately after passing the bill, thus precluding any further objections to it that day. Since the House of Commons failed to uphold the Constitution, the Senate should have done so by rejecting the bill. In The Strange Demise of British Canada: The Liberals and Canadian Nationalism, 1964-1968, Chris Champion notes that Prime Minister Pearson and his cabinet ministers legitimated their “neo-nationalism” of making Canada independent from the British Empire and United Kingdom ironically by portraying their ideas as having flowed naturally from Canada’s British inheritance. In fact, they were trying to substitute one system or another. These neo-nationalists believed that Canada must replace its “traditional identity and symbols with new ones, now matter how many Canadians opposed it,” and they portrayed their political opponents as “reactionaries mired in nostalgia.” In this way, neo-nationalists function rather like the vanguards of the proletarian revolution because they must drag these “Ready, Aye, Ready” Canadians who cling to Empire into modernity and out of their false Imperial consciousness. The neo-nationalist views Canadian history as a “nationalist teleology” such that Canadians have inevitably sought to eliminate what they would consider colonial vestiges in a journey from colony to nation – and ultimately, to a republic. In this neo-nationalist mould, Liberal Senator Florence Bird supported the bill and moved it to Second Reading in the Senate. Bird emphasized Canada’s inheritance of Westminster parliamentarism, trial by jury, the common law, and the recognition of fundamental freedoms like the freedom of speech. She regarded the transformation of Dominion Day into Canada Day as the culmination of Canada’s independence as a sovereign state. Bird cited the Statute of Westminster, 1931 and the Royal Style and Titles Act, 1953, and the Patriation of the Constitution itself as other examples and characterized this bill as “celebrating the national day of Canada as a completely independent country.” Bird sought to delegitimate “Dominion Day” by turning it to the neo-nationalist’s foreign “other”, and creating a false dichotomy between “Dominion” and “Canada,” as if the two terms were contradictory rather than complimentary. In reality, “Dominion Day” flows from the very same British traditions — parliamentarism, the common law, trial by jury, and liberty under law — that she praised. In her new construction, only paleo-nationalistic reactionaries loyal to the United Kingdom would opt for the colonial baggage of “Dominion,” while true Canadians loyal to Canada would choose “Canada.” Bird created a shameful false dichotomy and asked rhetorically, “Do you think that the men who fought in two world wars were fighting for dominion, or do you think that they were fighting for Canada? Those men wore proudly the word ‘Canada’ on their shoulder patches.” In fact, Canadians who served in the Canadian Army, Royal Canadian Navy, and Royal Canadian Air Force fought under the Red Ensign, for King and Country, for the Dominion of Canada, and for the British Empire. Bird portrayed “the Dominion of Canada” as a colonial artifact that signified Canada’s subordination to the Imperial Crown; referencing changes to the Royal Style and Titles from 1953, she noted that Canadians now swear an oath of allegiance to “the Queen of Canada, not to the Queen of the British Dominions Beyond the Seas.” Bird was playing fast and loose with history here, too. In 1867, the Dominion of Canada was a federation and Crown colony under the Imperial Crown, but the Imperial Crown had long since multiplied into the personal union of many crowns of many sovereign states by 1982 — that process had begun upon the passage of the Statute of Westminster in 1931. Bird concluded that Canada had finally “achieved full nationhood” in 1982 and that “the days of our so-called inferiority complex are over.” In reality, of course, “Dominion” is a Canadian invention, and it was Bird and her neo-nationalist colleagues who sufferred from an obvious and pathological inferiority complex and resentment toward the United Kingdom. Even today, the multiple layers of irony couched in Senator Bird’s statements leap out from the page. Liberal Senator George McIlraith argued that a Minister of the Crown should have tabled the bill as a government bill and that the Senate should let the bill die on the Order Paper rather that defeating it so that a Minister could re-introduce it as a government bill in the next session. Senator Ernest C. Manning implored his colleagues to reject the bill outright because of the unconstitutional manner in which the Commons had passed it; he noted that the Trudeau government had tabled similar government bills to this effect in the 1970s. They [the previous iterations of this bill] were not proceeded with in the other place [the House of Commons] because opposition to them was such that the [Trudeau] government wisely did not want to make an issue out of the legislation. In this case, as has been outlined, the matter was sneaked through the other house without debate, with less than a quorum in the house, and it now turns up on the Order Paper on this chamber for sober second thought. In 1982, I would have defended Dominion Day. But if the Parliament of Canada had to rechristen our national day, “Confederation Day” would have provided a much more suitable replacement, because it dignifies the creation of the Dominion of Canada on July 1st, 1867 with the historical gravitas and significance that the day deserves. A name like “Confederation Day” would also implicitly recognize that Canada’s history does not start at a French Revolution-style Year Zero in 1867. In terms of Canada’s political evolution, 1848, when London granted the United Province of Canada responsible government – is a far more significant year than is 1867. In contrast, “Canada Day” has the air of a prosaic, banal, non-descript, unoriginal, and politically correct moniker created solely to minimize offence. It does not convey any concrete meaning, and it implies that Canadian history begins in 1867 and that anything which antedates Confederation is “British” or “Imperial” and therefore ought to be filed under forgotten and treated as a shameful anachronism. Our sister realm of Australia calls itself officially “The Commonwealth of Australia” without monarchical pretension, and in Australia, “the Commonwealth” or “the Commonwealth government” serves as a metonymy for the federal government of Australia much as “Dominion” and “Dominion government” once did here in Canada. That said, Australia has adopted the equally banal and politically correct name of “Australia Day” for its national holiday. I once thought that any attempt to restore the long-form of this country’s name to The Dominion of Canada – perhaps for the Sesquicentennial in 2017 – would be portrayed as an unpardonable imperial retrogression; I now suspect that it would, if anything, simply be met with confusion and bewilderment rather than hostility. At least hostility would imply some kind of engagement on the issue; the confusion that would likely result shows that over the course of thirty-one years, Canadians have been deracinated from their history and raised on Pearsonian neo-nationalism, and that Canada’s old official name, “Dominion,” has been successfully denormalized and delegitimated. I find myself in a George Grant-like lament for a nation. I do lament the loss of Dominion Day, both because I disagree with the substance of the bill and because I disagree with the unconstitutional knowingly fraudulent manner in which Liberal neo-nationalists rammed it through the Commons. Sadly, the “Dominion of Canada” and “Dominion Day” have been consigned to the revolutionary’s proverbial dustbin of history. Unfortunately, the neo-nationalists and crypto-republicans won this battle. But the slow death of “Dominion” in Canadian public institutions did not occur inevitably according to some post-colonialist or republican teleology: successive governments let it decline and made the decision to abandon it. “Confederation Day”: I Agree with Eugene Forsey on Something! Janet Ajzenstat et al., ed. Canada’s Founding Debates. (Toronto: University of Toronto Press, 1999): 60. George M. Wrong and H.H. Langton, ed. The Chronicles of Canada: Volume VIII – The Growth of Nationality (Tuscon, AZ: Fireship Press, 2009): 61. David Baker, Commons Debates, 31st Parliament, 1st Session, 9 July 1982: 19201. Senator David Walker, Senate Debates, 31st Parliament, 1st Session, 3 August 1982. C.P. Champion, The Strange Demise of British Canada: The Liberals and Canadian Nationalism, 1964-1968 (Montreal-Kingston: McGill-Queen’s University Press, 2010), 3-15. Ibid., 15. For instance, Pearson even tabled the resolution to adopt the Maple Leaf flag on the 749th anniversary of Magna Carta. Senator Bird in Senate Debates, 32nd Parliament, 1st Session, 22 July 1982: 4668. Senator McIlraith in Senate Debates, 32nd Parliament, 1st Session, 22 July 1982: 4671. Senator Ernest C. Manning in Senate Debates, 32nd Parliament, 1st Session, 22 July 1982: 4672. This entry was posted in Dominion Day, History of British North America. Bookmark the permalink. Well argued, but I can’t see it changing now. I do agree that ‘Canada Day’ is rather silly sans historic meaning. Confederation Day would at least assist us in thinking about our own history; not a bad thing. Other than mention during Senate debate on the Bill in question, is there any official notation that there were only 13 Members in the House of Commons Chamber when the House Bill was passed? For instance, is there any such notation in the Journals of the House?